It's practically Thanksgiving! No doubt, most of you are busy prepping for the big day (hopefully, there aren't too many last-minute errands...we're slated to get a load of snow tomorrow in NJ!). I'm once again heading out to enjoy a feast with my extended family. This year, I managed to get out of turkey duty! There's something about prepping that bird for a crowd that stresses me out. Apparently, I'm not alone because no one else in my family has turkey duty this year either. We've decided to outsource that particular task (I hope no one is horrified by this revelation). Since we usually head out to gather with family for Thanksgiving and since I'm taking that reprieve from turkey prepping on the big day (what will I do with all that extra time on my hands! ), I decided to have a mini Thanksgiving dinner for the 3 of us at home this past Sunday. I'm talking about a cozy, very simple, no-stress, mini Thanksgiving meal before the actual day. I roasted a small turkey breast and made a couple of quick sides. Sides are fun! Everything was simple and it really didn't take much more work than an ordinary Sunday night dinner. The mini Thanksgiving idea having surfaced, my mind went on to a quick dessert. 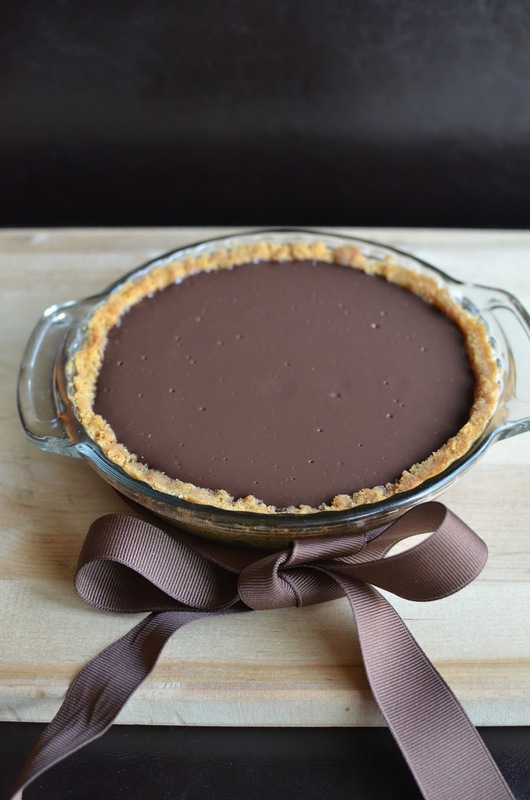 This lighter chocolate pudding pie is one of my son's favorite things so I thought I'd whip one of those up. I usually make the crust with graham crackers and have also had a lot of success using digestive biscuits recently. This time, I didn't have either of those on hand but I did have Nilla wafers. And in the spirit of keeping things simple and stress-free, I thought I'd just use what I had and give the Nilla wafers a try. I finally got a chance to use my mini 6-inch, pie plate, which I bought months ago (since it was so cute). I whipped up the crust, made the simple pudding, which contains no eggs or butter so it's nice and light, and we were ready for our mini Thanksgiving before Thanksgiving. We may be in the midst of Thanksgiving prep (those grocery stores are jam packed!) but it's Christmas that I can't get my mind off of. I'm always eager to get started on holiday baking! It's such a wonderful time of year; I only wish we had more time (I think two months would be perfect) between Thanksgiving and Christmas to stretch it out and enjoy it more. Short of moving to Canada where we can celebrate Thanksgiving in October, I guess we have to make do with our schedule. That means it's time to get started on cookies! I have old-favorites to make but I eased into my holiday baking with this batch of chocolate-chestnut thumbprint cookies, a chocolate chip cookie filled with chestnut cream. There's something about thumbprints that screams 'holiday cookies', right? And this is the time of year when we look for simple recipes that have a little spin or twist to them that make them a bit extra special. I've wanted to try this recipe for a long time because these cookies are like that - very easy to make, with a little twist in the middle. 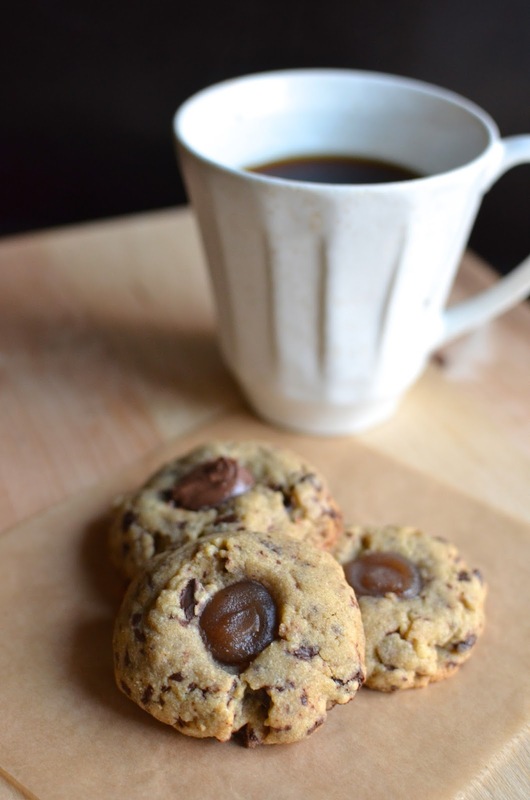 The base cookie dough is essentially a chocolate chip cookie. Make an indentation in the center and fill it with a dollop of chestnut cream for a different spin. You might know that I love chestnuts, in all forms. If that's not the case for you or if you can't get your hands on chestnut cream ("crème de marrons"), you can also fill the cookie centers easily with a spoonful of Nutella chocolate-hazelnut spread (I bet you have that!). If you don't mind a little more work, I think a fudge filling like the one I used for the fudge oatmeal cookies would work beautifully. I filled my thumbprints with chestnut cream as well as Nutella. If you find the kind of chestnut cream that comes in a tube, it makes filling the thumbprints so easy. Between the two, the chestnut cream filling gives you a different flavor component, a milder kind of sweetness. It's a fun change and a little twist to the usual. 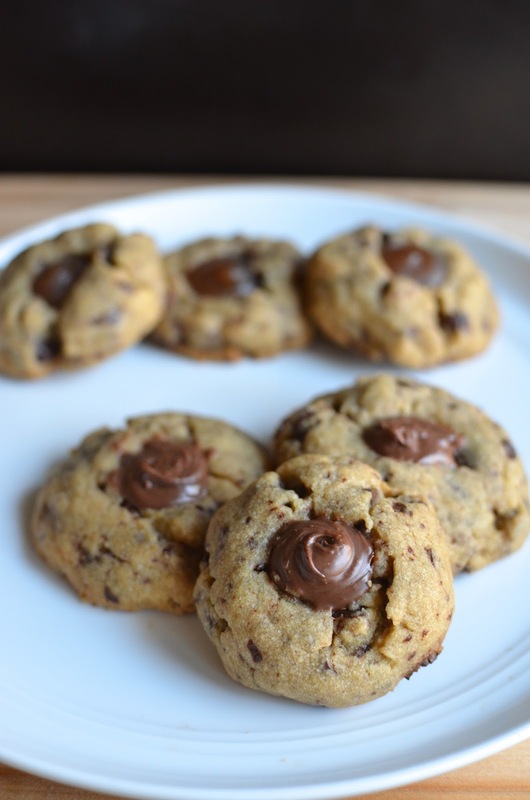 The Nutella, or a chocolate filling, will give you more of a familiar, traditional chocolate chip cookie taste. Both are good. My husband and I liked the chestnut combination; the little one preferred the Nutella. I have long been a fan of baked goods and desserts made with matcha. This finely milled green tea powder provides a subtle dose of bitterness that mellows the sweetness of desserts and creates a kind of savory aspect to the sweet that works really well, in my opinion. 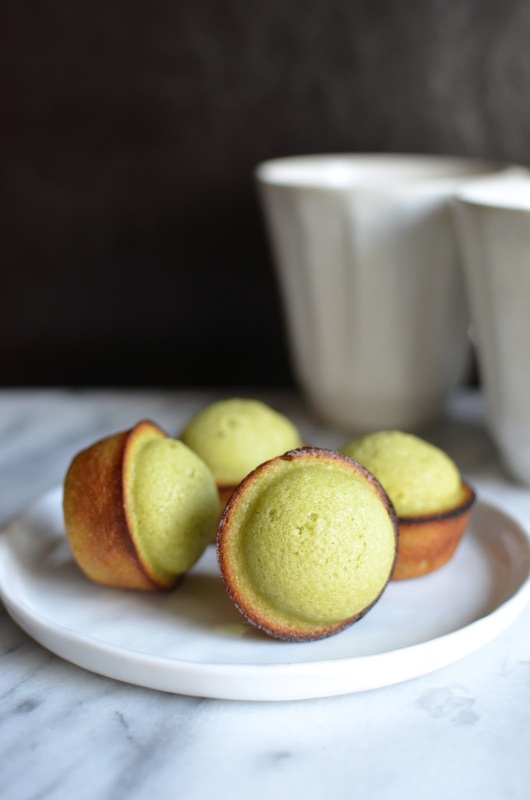 It took me long enough but I finally ordered some culinary-grade matcha (I knew just what to get thanks to Nami at Just One Cookbook) and started my green tea adventures with a batch of matcha financiers. Bear with me as I repeat: I love financiers! 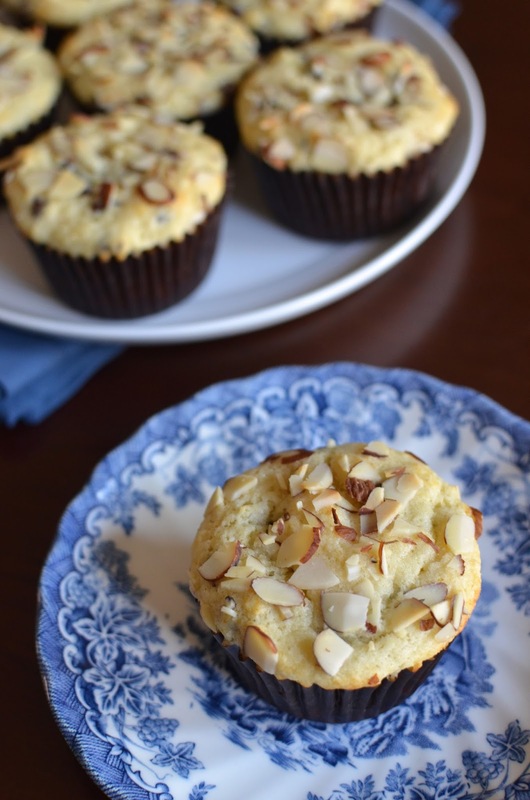 I bake mine in muffin tins and I think these French tea cakes are like the best muffins on earth. Made with a generous amount of butter, as well as with ground nuts and egg whites, these little cakes bake up crisp along the edges and meltingly moist and flavorful inside. 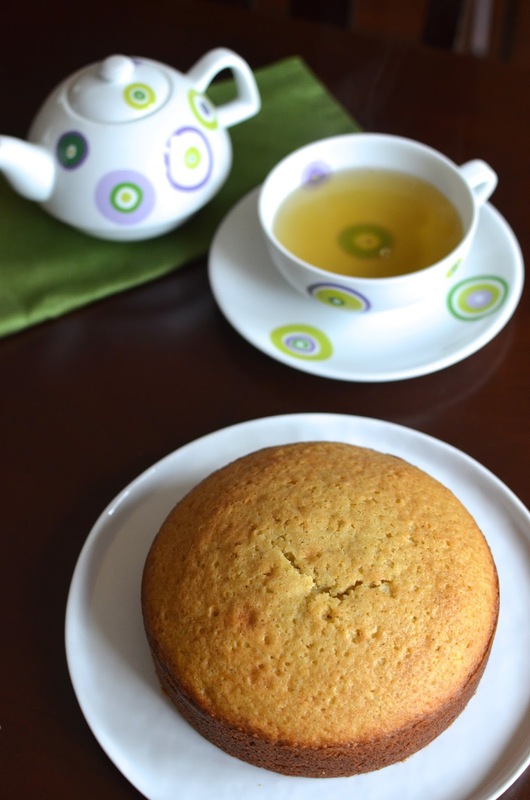 I have made hazelnut ones and experimented with a pistachio version; now, I got to try a batch of green tea! 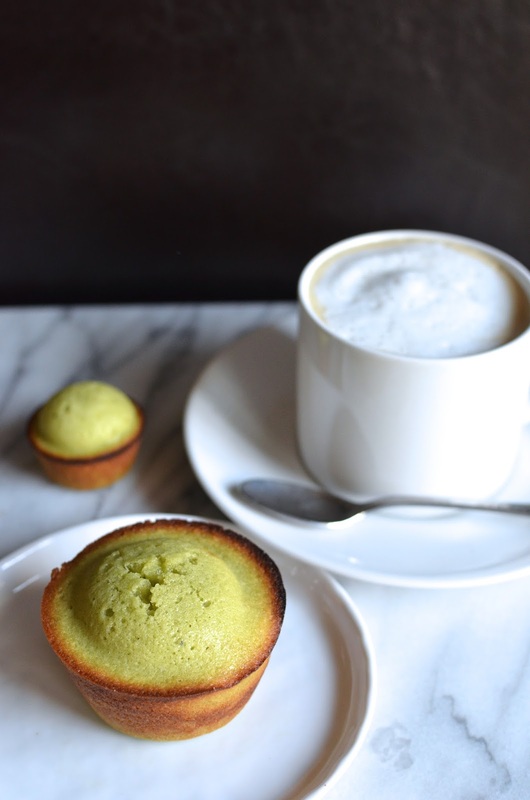 These green tea financiers did not disappoint; they were what a good financier should be - rich, moist, flavorful. I usually make financiers with brown butter (a recipe from Paris Sweets that I'm devoted to) but that's not the case here, and I was afraid I'd miss it; happily, these were still rich, nutty, and delicious. The green tea flavor is discernible but not overpowering (to me, anyway...if you're not sure how you feel about it, start with a smaller amount of matcha). I think this is a great example of East meets West in the world of desserts. 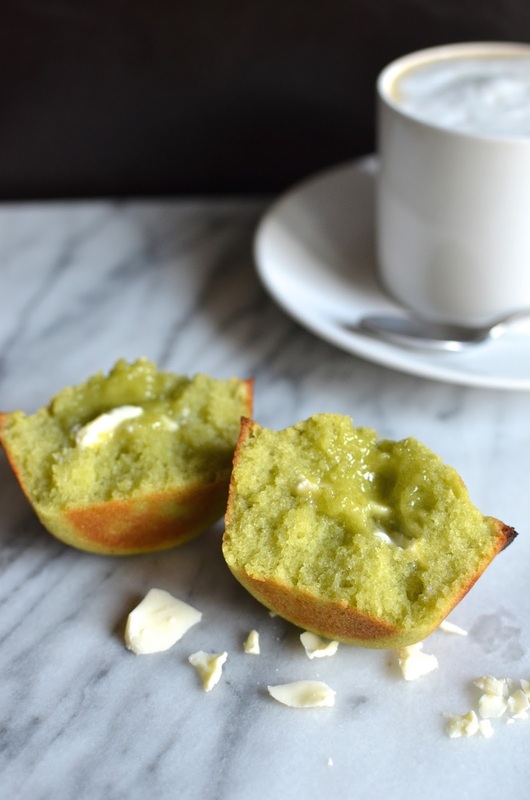 I baked these matcha financiers in mini as well as regular-sized muffin tins. Generally, the little ones bake up more evenly throughout, whereas the larger ones tend to stay slightly wet in the very center. Given their richness, mini's are a good option but my family and I actually really like the slightly under-cooked centers so we have a preference for the larger ones. And like all financiers, these are best eaten fresh after the edges have cooled to an almost shattering crispness. You can store the batter in the fridge for 3 days and bake them in batches. I find that briefly re-heating leftovers the next morning in a warm, 325 degree oven, brings back that crisp freshness as well. It seems like I've been seeing mushrooms everywhere I turn - featured in magazines and cooking shows - and since I'm a big fan of it myself, I was inspired to try a new recipe. I've never cooked with dried mushrooms with the exception of Chinese shiitake and this pasta dish gave me the chance to cook with dried porcini mushrooms. I've been having a great time trying out new savory recipes and been rewarded with some definite keepers. This one goes on that list. This pasta (I used pappardelle, which I love, but you could also use tagliatelle or other noodles) is coated with a light sauce that's like a ragu, in my mind, only it's vegetarian and quick to make. The porcini mushrooms are so intense - meaty, and with a strong flavor that carries the dish. I played around with the recipe a bit, doing things like using shallots instead of onions and less tomato paste than called for because I wanted the porcini flavor to be the main focus. A little goes a long way with the dried porcini and when you reconstitute it in a little stock, you end up with not only moist, plump mushrooms but also a deep, dark, flavorful liquid that becomes a serious flavor addition to your dish. This made a very delicious, satisfying weekend lunch recently. Even the little guy, who's no longer a mushroom fan (he once was as a toddler) enjoyed some while my husband savored his generous bowl. That always puts a smile on my face. If you like mushrooms but rarely cook with dried ones, maybe it's time to mix things up and give it some attention. I am eager to make porcini risotto soon. Have you noticed the deluge of cookbooks published recently? Maybe the timing has to do with the upcoming holiday season but I just don't remember noticing such a swell of cookbooks being published around the same time before. I'm talking cookbooks from...The Kitchn, Skinnytaste, Joy the Baker, How Sweet Eats, the guys from Baked, as well as new editions from Ina Garten, Martha Stewart, Yotam Ottolenghi...and a lot more! I'm excited about it all because it means more inspiration, more deliciousness to see and discover. One of the baking books I was really impressed with is Dorie Greenspan's latest, Baking Chez Moi. It shouldn't have come as a surprise since I think Dorie's books are always so substantial - as in, there's just so much substance to them. Her recipes are so detailed, but not complicated. She provides tips and suggestions to guide you towards being as successful as possible in the kitchen. I saw many recipes I'd like to make in the book. I started right at the beginning, with a very simple (but smart) "weekend" cake. It's the kind of simple yet delicious dessert the French bake at home. It's easily prepared, with staying power to sit around for a few days to be enjoyed at any time when the mood is right. I love this kind of cake. Break out the bowls and whisks! It feels comforting both to prepare as well as to eat. 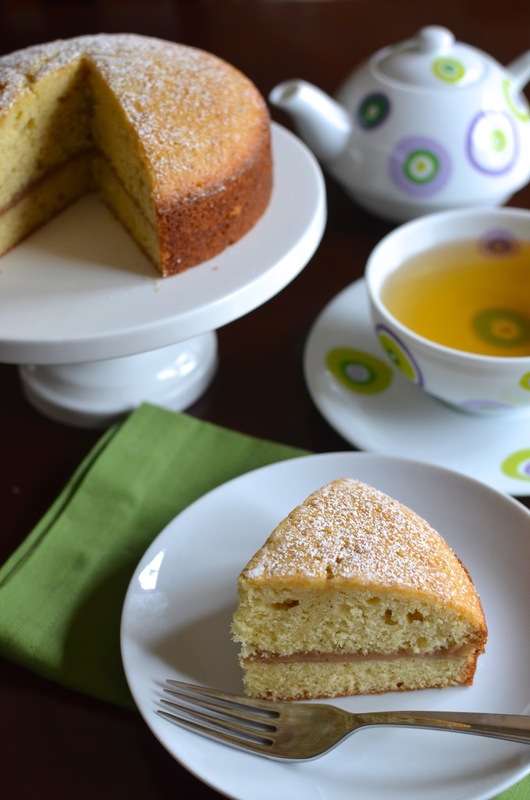 The texture of this cake is firm and sturdy but moist. It has a chewiness to it; my son thought I'd used almond paste because of the nutty, chewy, moistness of it that resembles certain almond paste bakes. As for flavor, it's rich and full of the deliciousness of brown butter, something I'm in awe of every time I stand by the stove swirling my little pan making a batch for one of my favorite recipes, financiers (coincidentally, another recipe I picked up from one of Dorie's books). It's called beurre noisette, or hazelnut butter, for a good reason. Cooking the butter, letting it sizzle and brown, somehow releases an aroma and flavor like caramelized hazelnuts. It's kind of magical, and delicious in combination with the flavor of fresh vanilla (and a touch of amaretto) in this cake. 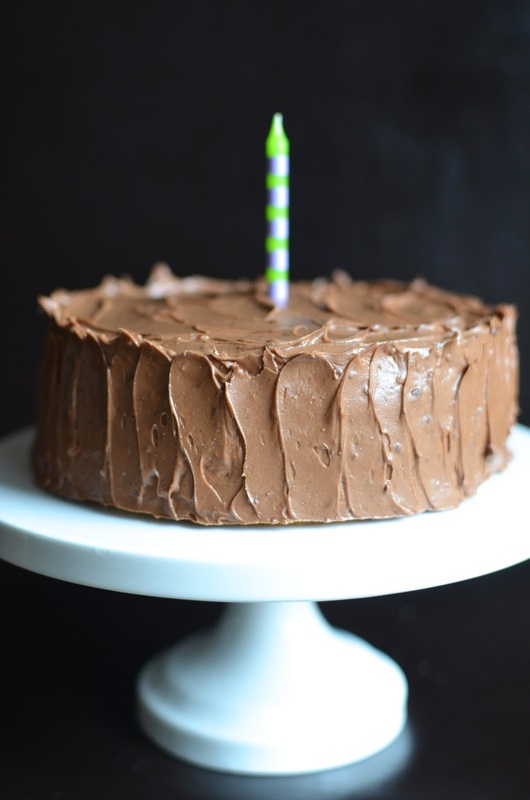 This cake is meant to be easy, transportable, low-maintenance. By all means, make it as intended...or...give it a little twist like I did it. The original recipe was meant for a standard-size loaf pan. I divided the recipe in half and made a smaller 6-inch round version that's perfect for my family to enjoy over a weekend. And because this cake reminded me so much of those delectable financiers (it looks and taste quite similar), I decided to split my cake into two layers and add a slather of chestnut cream in between. You can certainly leave the cake plain, without any filling, but I love chestnut cream (and chestnuts, in general) and almost every time I make financiers, I tuck a small spoonful of it into the ones for my husband and I. I think the flavor of the chestnut cream complements the brown butter - there's a certain similarity in the nuttiness of their flavors.